• The exhibition, which aims to tell the story of the playa’s limitless creativity, is a close collaboration between Burning Man Project and the Renwick Gallery that started in 2016. • Large and small-scale Burning Man pieces will be spread throughout the gallery floors and the surrounding Washington D.C. neighborhood. • “No Spectators” will feature installation art, jewelry, costumes, and photography, some of which were drawn from a call out to the Burning Man community by the Civic Arts department with the help of volunteer Affinity Mingle. • The exhibition will be on display from March 30, 2018 – January 21, 2019. This is the first post in a series about “No Spectators: The Art of Burning Man”, the upcoming exhibition at the Renwick Gallery of the Smithsonian American Art Museum. Have you heard that Burning Man is going to be in the Smithsonian? That’s a lot to wrap your mind around, isn’t it? Yes, the first national art museum of the United States is opening an exhibition called “No Spectators: The Art of Burning Man” on March 30, 2018 in the glorious Renwick Gallery of the Smithsonian American Art Museum. “But wait,” you might ask. “How can there be ‘no spectators’ in a museum?” Mighty good question. Let us ask Nora Atkinson, the Lloyd Herman Curator of Craft at the Renwick Gallery, this and many other questions about art, craft, community, what the Renwick is, and how we’re going about creating an exhibition about Burning Man together. The Renwick Gallery of the Smithsonian American Art Museum. Sounds important. What is the Renwick Gallery, and how did you end up as its curator? Nora Atkinson: The Renwick Gallery is the national museum of American craft. It’s located right kitty-corner to the White House. My job here is to define and interpret our American cultural identity through the objects we make — the things we think are important to count as our own. I come from an unusual background for a craft curator. I studied photography and art history in college, then went to grad school and studied museology at the University of Washington. While I was in grad school, I got a job at the Bellevue Arts Museum in Bellevue, Washington, which is focused particularly on craft. Craft was outside where I had come from, so I brought my skills from those other areas and learned craft on the job, which has helped me bring my own interpretation to the field. I also had an incredible experience working under Michael Monroe, who was former director of the Renwick Gallery. I worked with him there for seven years or so. About four years ago, the Renwick Gallery opened a new position for a second curator, endowed by original director of the museum, Lloyd Herman. I applied for that job in the “other Washington” and amazingly got it, and I traveled cross-country to go make that happen. It was the first time I’d lived outside the Northwest, apart from a brief time in Europe during college. One of the reasons I wanted to do an exhibition about Burning Man is the shock I had during this sudden exodus from the West Coast to the East Coast. I wanted to bring a little of that West Coast culture into the new place that I love. Please say more about that. What does it mean for you to have brought your experience from the West Coast to the East Coast? Burning Man started in San Francisco, and it almost couldn’t have started anywhere else, but now it’s coming to a national museum in D.C. What are the cultural differences between the coasts? NA: I think it’s a huge difference. Here on the East Coast, the first thing people ask you is “What do you do? Where did you go to school?” — very formal questions. In the Northwest, it was, “What do you do for fun? Who are you?” It seems like a difference in priorities. I appreciate some of the things I’ve found here in Washington, D.C. — about the culture and the deep history we have, and the national attention things garner — but it contrasts with the frontier mentality on the West Coast, where it’s really more about what you’re building for yourself. And the West Coast will always be home. Since you started at the Smithsonian, what are other exhibitions you’ve helped bring to life, and how did they lead to one about Burning Man? NA: The Renwick has traditionally been a Studio Craft museum. It opened in 1972, which was the height of the Studio Craft movement. Once we hit the new millennium, artists started to diverge from that focus on skilled craft, colleges became more interdisciplinary and whatnot. I think the consensus in our field today is that the Studio Craft movement is pretty much done at this point, and we’ve moved on to something else, a new phase in craft, and this gives us a little freedom. So we’ve been looking around at the fringes of things, looking at a more broad spectrum of what we consider crafts outside the category of “studio craft” — looking at the Maker movement, looking at social practice craft artists, performance crafts, stuff that is not in the canon but still belongs to the same philosophy and genealogy. When I arrived at the Renwick, the museum was going through a major two-year renovation, so we were closed for that whole period of time. I couldn’t even enter the building without a hard hat, and I was located in an office on the other side of town, so it was a little disorienting trying to curate shows. The first show we opened with was called WONDER, curated by my colleague, Nicholas Bell. That show was kind of the first time we took a step out of our usual. As they were removing all the objects from the building [for the renovation], he looked around at the architecture of the building — the Renwick was the original Corchoran Gallery of Art, built in 1860s on Pennsylvania Avenue — and realized the building itself was maybe the most important object in our collection. He wanted to highlight that, so he gave over each of our galleries to a different major contemporary artist to create a room-sized installation that was meant to highlight the architecture. [Cool note: Burning Man Project board member Leo Villareal was one of the artists.] The artists selected wouldn’t typically be considered “craft artists,” but they were using craft media and processes, so there was a strong relationship there. That exhibition was an incredible success. We were a sleepy little museum, and we went from about 150,000 [annual] visitors to over 800,000 visitors in the first six months of being reopened, with lines out the door. There were a few things we did right: We connected with this contemporary desire to have immersive environmental installations. We put up signs on the wall that said “photography encouraged”, and people took it and ran with it. It brought in a whole different crowd than we had ever connected with before. After that exhibition, we reinstalled the permanent collection, which I was responsible for. The permanent collection is one of the premier collections of American craft in the country, predominately studio craft from 1970s on. The concept I was working with for putting the permanent collection back on view was thinking about how we experience objects differently in the digital age. Our culture has become much more visual; it’s not as linear as it once was. I brought together all these objects to connect them in such a way that you could walk through the gallery and find your own path the way you would in a virtual environment. That interplay between physical and virtual environments is key. In the contemporary era, I think the reason craft is important is that it provides the humanist side to the world. The more we connect digitally rather than physically, the more we long to connect to the physical world and the people around us. That’s one of the things that really drew me to want to do a show about Burning Man. That all sounds remarkably Burning Man-like. So much of Burning Man culture is coming up with ideas and seeing them through on one’s own or with one’s friends, or with less formal training. Can you talk more about the draw to doing an exhibition about Burning Man that’s not just about pretty art? What about Maker culture aligns with the vision you have for the Renwick Gallery? 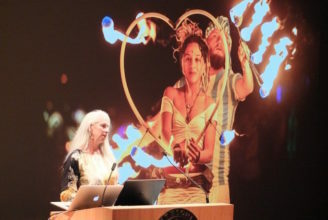 NA: I feel like Burning Man art aligns with a lot of the traditional values in the craft community. Modern craft begins with the Industrial Revolution, the point at which people no longer had to make by hand. It became a less efficient way to do things, but people were choosing to create crafts because it was creating community and enriching the human spirit. Studio craft was all about being in the studio and creating perfect objects, raising craft to the level of art. We got to the point where artists were creating things you couldn’t tell was made by hand — that was the goal there. Things have really transformed in the field as a lot of technical skills are no longer taught in schools. People are actually learning their skills from other people, they’re learning online, they’re experimenting, and they’re teaching each other. That DIY nature is what a lot of contemporary work is about; it’s about the creation of community through that work. Burning Man art is about creating a community, whether because you’re doing it as a collective or because you’re trying to communicate and are creating specifically for the enjoyment of all these people around you. I think there’s a major separation in the contemporary art world. Craft has always been the stepchild of the art world. It’s essentially about skills, and that takes thousands of hours of training. The contemporary art world is all about the thought versus the skill. Burning Man art is actually about communication. NA: This is one of the challenges for this exhibition! The landscape is such a part of what Burning Man is. We are trying to bring the landscape into the building, through video, time-lapses and virtual reality. We also decided to partner with the Golden Triangle Business Improvement District to get some work out into our local community, because riding out to artwork is such an essential part of Burning Man. Burning Man and the Smithsonian get to meet each other halfway in this. Work that looks really small when you see it out on playa will look absolutely massive within the space of the building. The building itself has this incredible grandeur, high ceilings and tall columns. That provides an interesting juxtaposition, giving Burning Man an old-world patina. Our building was actually the first purpose-built art museum in the country. Right above the front door, we have this inscription that says, “Dedicated to art”. William Wilson Corcoran believed it was one of the pillars of democracy. It’s not kitty-corner to the White House by accident; he wanted that view of art to be visible from the seat of government in the country. That’s something the Smithsonian brings to the Burning Man community. Smithsonian gets that play and participation and openness that Burning Man brings, which aligns with our values. Burning Man gets the Smithsonian’s badge that this is an important part of who we are as an American culture. So, how was your Burn? How did your experience on playa shape this exhibition? NA: Going out to playa having known about it for such a long time — having had so many friends in the community, and now having studied for months about it — I felt like I had everything in my head about what that experience was going to be. Nothing surprised me. I was prepared for all of it. It was just so much better for having been there. It was so much of a different experience for the sights and the sounds… the way society acts so much differently when you hug each other! It was a very freeing experience. I was not going to be the person who drank the kool-aid and said this changed my life, but I did go out and, for the first time in many many years, felt more myself. Being in the working environment for so long, focusing on certain things, other parts of my personality got lost, and this was a way to recenter. I completely loved it. I will go back every year from here on out. The artwork for the exhibition was mostly selected before I went out. I felt really good about those selections. But I learned a few things about the way the art functions on playa. Somebody said to me, every single piece of art on playa is time-based, and it’s not just because it’s participatory, but it’s because in order to experience it, you have to travel to it. You spend these five minutes of it getting larger and larger. You have this intimate relationship with every piece because of the time you’ve invested in it from the first moment you saw it. That was key to the experience, and I wanted to bring it to the show. It made me very glad I have pieces out in our local community, too, because people do have to make a commitment to those works and go seek them out. I’ve also decided to include a hallway where we’re going to have videos of some of the pieces on playa that are too large or dangerous to bring to the museum, so some of those artists who are so important to the community can still be included, and you can get a little more of that sense of time as well. If I knew nothing about Burning Man, hadn’t been, and I live in D.C. or am visiting, why should I care about this exhibition? NA: Well, I think all your friends are gonna be talking about it. But you should come see it because it’s participatory, it’s inviting people to get involved in an art museum in a way most people never will. I know it will be visually dazzling, but I also think it will be a very emotional experience, and I think, right now, in the present climate of this country, everybody needs that. What connects me to the art work, and what connects to the history of crafts to me as well, is that ethos that the handmade can bring people together, form community, and enrich the human spirit. Nora Atkinson is the Lloyd Herman Curator of Craft at the Smithsonian American Art Museum. She joined the museum’s staff in March 2014. Atkinson was part of the team responsible for the recent renovation of the Renwick Gallery, the museum’s branch for contemporary craft and decorative art. Tagged: 2018afterburn, 2018afterburn-civic, No Spectators: The Art of Burning Man. I have never been to the Smithsonian or D.C. and would love to travel there to see the opening of the exhibition. Does anyone know if there will be a special opening for it and is that opening different than the general exhibition which will take place? I’m a native of the DC area and a long time Burner. After years of traveling to Burning Man and years of answering the same questions over and over – finally, some of BM is leaking back into the East Coast mainstream. I am already looking forward to the responses of my non-burner friends. This is a very good thing. Next up will be some sort of permanent (but changing?) exhibit at the Smithsonian as the profound influence of BM on American culture gains recognition. One thing not mentioned: part of the exhibit at the Renwick is currently installed in the Nevada Museum of Art in Reno. That exhibit is called “City of Dust” and it’s an archive show covering Burning Man’s history. It’s up til January 7, 2018. Then they pack it up and send it to DC. http://www.nevadaart.org/exhibition/city-of-dust-the-evolution-of-burning-man/. Thanks for the link & for noting that exhibit. Great stuff. Are you part of Nevada Art? SO we are looking for better things.